Schutzengel (Scots: "Guardian Angel") bi Bernhard Plockhorst depicts a guardian angel watchin ower twa bairns. 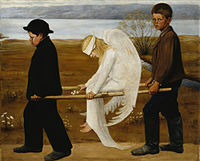 An angel, an aa spelled aungel, is a supernaitural bein or spirit foond in various releegions an meethologies. 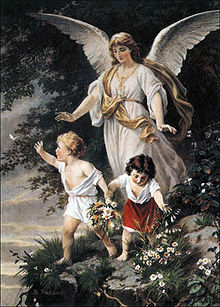 In Abrahamic releegions an Zoroastrianism, angels are eften depictit as benevolent celestial beins who act as intermediaries atween God or Heiven an Yird, or as guardian spirits or a guidin influence. This page wis last eeditit on 9 Mairch 2019, at 02:34.